There is an invigorating new chill in the air at Deep Creek Lake! Average temperatures are beginning to drop from the 70s into the low-60s during the day, and at night, temperatures will eventually dip down into the upper-30s, bringing about exciting changes to the surrounding foliage. We’re already seeing scattered flecks of pale yellow, orange and red on the hillsides which means it’s time to plan your trip to witness Maryland’s fantastic fall foliage. As evidenced by Travel Channel’s list of Best Fall Foliage Road Trips 2013, Deep Creek Lake, Maryland is the place to be to see the changing leaves! Here are our favorite Maryland fall foliage drives, right from our front door. Enjoy the un-commercialized tranquility of the Amish Country on this drive from Deep Creek Lake to neighboring Pennsylvania. From Lake Pointe Inn, take Route 219 North to Route 40 East toward Grantsville. Before too long, take a left onto Route 669 toward Springs PA. Look out for horse and buggies while passing through town and continue toward St. Paul Rd. St. Paul Rd. will turn into Mt. Davis Rd. at which point you’ll be on your way to Mt. Davis, the highest point in Pennsylvania. Stop at the Mt. Davis parking area to the left of the historic marker and walk up the 50 foot observation tower to take in the view of the surrounding countryside. If you wish to linger, there are also several hiking trails that will enable you to immerse yourself in the beautiful fall foliage. After exploring the Mt. Davis area, continue West toward Listonburg PA through Forbes State Park. Along this route, you will pass by Deer Valley Lake and High Point Lake. You may want to stop to take pictures of one or both of these lakes and the surrounding foliage. Mt. Davis Rd. will wind its way West to Listonburg Rd., where you can head South on Listonburg Rd. to connect once again with Route 40. Take 40 East to Route 219 South to return to Deep Creek Lake. 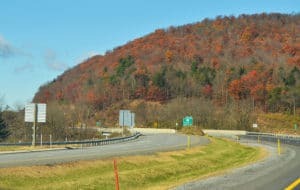 View beautiful mountain ridges covered in vibrant fall colors on this Maryland fall foliage drive. Make this drive a loop from Deep Creek Lake, or when your Deep Creek Lake vacation is finished and you’re headed back to Baltimore or D.C., this is a great detour to Route 68 to catch some amazing Maryland fall foliage. From the Inn, take Route 219 South. After you pass Uno’s Pizzeria & Grill, turn left onto Glendale Rd. When the road comes to a “T”, take a left onto Bittinger Rd./Route 495. Soak in the scenery of Big Run State Park as you travel North on Bittinger Rd. Take a slight right onto New Germany Rd. for a stop at the Monroe Run Scenic Overlook. This breathtaking overlook offers views of New Germany State Park and nearby Savage River State Forest. Once you have had your fill of Maryland fall foliage photographs, backtrack on New Germany Rd. to Bittinger Rd./Route 495 and head North to Route 40. To return to the Inn, take Route 40 East back to Route 219 South. Upon your return to Lake Pointe Inn, we’ll be prepared to offer you all the comforts you’ve come to expect from our Maryland bed and breakfast. Our lakefront location ensures you will continue to enjoy the Maryland fall foliage long after your daytime drive is over. Book your reservation for your luxurious fall experience now.